Dashboards are a great way of displaying important data for your sales team. Now that you can see how good sales dashboards can be, we'll cover the steps you need to quickly set one up for you and your team. We'll be using our new Salesforce integration - which pulls in data from your Salesforce reports - to build the sales dashboard. In other words, you create your Salesforce reports first and then build the visualization from that report in Geckoboard. 1. If you haven't already, you can sign up for a free 30-day Geckoboard trial here. 2. After you're logged in to your account, click on the 'Dashboards' menu to the top left and add a new dashboard by clicking on '+ Add dashboard'. Give your dashboard a name. 3. On your newly created dashboard, click on 'Settings' in the header and then 'Dashboard settings'. Set the dashboard's Location and Timezone to match the timezone set within your Salesforce account. This is required to ensure there's no lag in the data being fetched from your Salesforce account. 4. Set the dashboard width to 6 columns (1430px). If you need, you can adjust the dashboard width to match that of your display screen later on. 5. The default settings should be good for the remaining options on this page. Click 'Save Changes'. 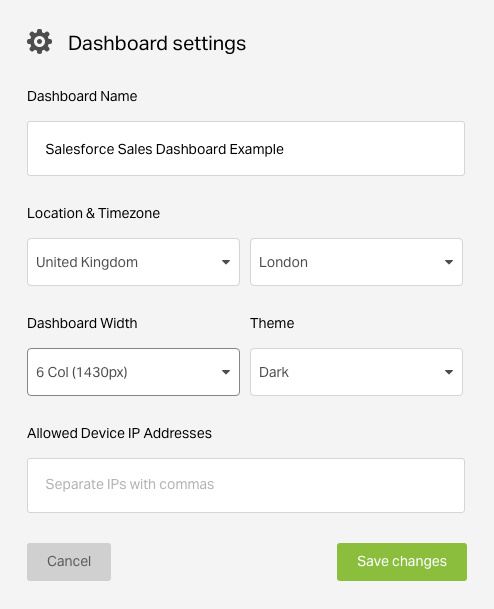 You'll need to create a connection to your Salesforce so that Geckoboard is able to reach your reports. 2. Now, search for 'Salesforce' using the search bar on the left. Alternatively, you can also scroll down the list of integrations ordered alphabetically till you reach the new Salesforce integration. 3. Click on the integration to proceed further. 4. You'll now be prompted to create a connection. 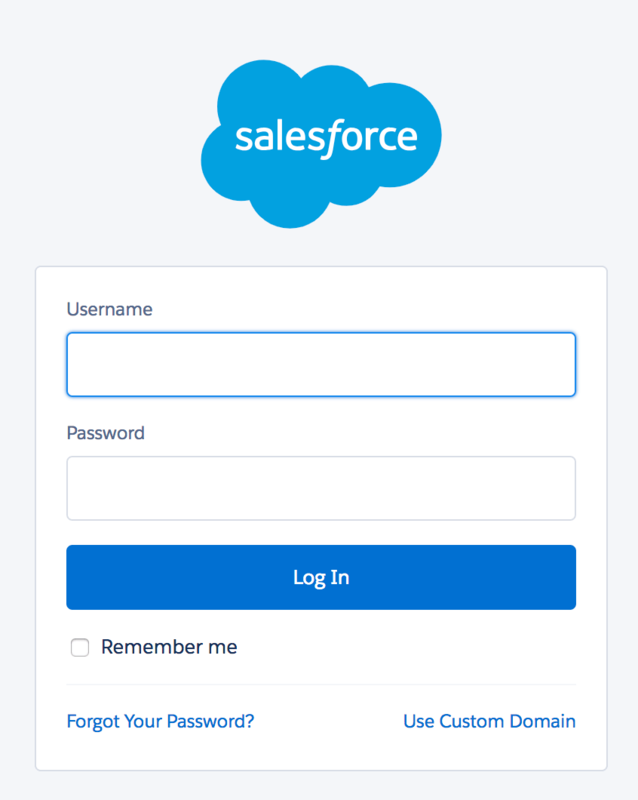 If you're already logged in to your Salesforce account in the same browser, Geckoboard will automatically authenticate and create the connection. Otherwise you'll have to enter your Salesforce credentials in the window that pops up. Your Salesforce connection should be set up now! You only need to do this once. Going forward all the widgets you add will be able to access this connection and pull in data from your Salesforce reports. If necessary, you can also similarly create connections with multiple Salesforce accounts. Note: To successfully connect Salesforce and Geckoboard, your Salesforce account must be on a plan that includes API access. Also, your Salesforce user must have been granted "API Enabled" permission. If you need this enabled, please read our "How do I enable API Access in Salesforce" article to find out how or contact whoever administers your Salesforce account. 1) Our Salesforce integration can only visualize data from Custom Reports. 2) The particular filters and options you'll need to use for building your report in your Salesforce account may be different from the ones used in our examples. For example, for the 'Sales leads' widget, you may already have your Sales agents split up into teams based on their location. You could then simply select 'US Sales Team' instead of selecting 'All Leads' first and then having to filter based on the Lead's country. Basically, the idea here is that you create a custom Summary or Matrix report just as you normally would in your Salesforce for tracking the metrics you're interested in. Geckoboard will be able to pull in and display those metrics on your dashboards. 3) Our Salesforce integration supports only Summary, Tabular and Matrix reports. If you'd like to use Joined reports, drop us a line and let us know how they'll be useful to you. 4) You can specify how often a Salesforce widget should refresh. You'll have this option for each individual Salesforce widget you create. Select a refresh rate based on how often you want to see the data refresh while keeping in mind the total API requests allowed on your Salesforce account. Note: Salesforce enforces its limits against the aggregate of all API calls made by your organization in a 24-hour period. For more details, please check out this article. This widget displays the number of leads being worked by the US team from the past 7 days with a goal of 7 leads for the period. 1) We'll be building a simple custom report here. Head over to your Salesforce account, click on the 'Reports' tabs and then on 'New Report...'. 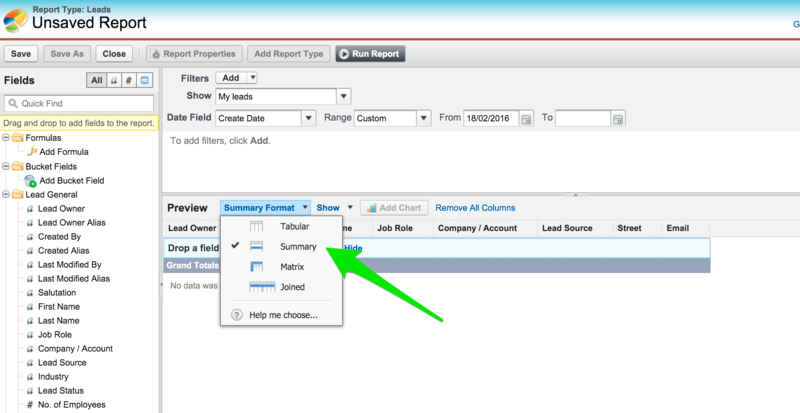 2) Select the 'Leads' folder under 'Select Report Type' and click on the 'Create' button. 3) We'll be using a Summary report, so go ahead and change the format from Tabular to Summary. Select 'All Leads' from the Show drop-down. Range: Last 7 days (the From and To fields will automatically populate). Click on the 'Add' next to Filters (use the 'Field Filter' option if you've clicked on the triangle next to 'Add'). Set the filter as 'Lead Status' equals 'Qualified'. Click on 'OK' when you're done. Similarly, add another filter and set 'Lead: Address - Country' equals US. Click 'OK' when you're done. 5) A preview of the report should now show up. It'll have many columns that aren't particularly useful for this report. So go ahead and remove the ones you don't need. You can then also rearrange or add more columns to help make more sense of the report. Here's a GIF demonstrating this. You can also uncheck 'Details' under the 'Show' menu next to Preview. This will hide all columns except the ones directly involved in generating the report. 6) The report is nearly ready. Our Salesforce integration needs the data to be grouped to be able to visualize it. So, in this example, we'll go ahead and group by 'Lead Owner'. 7) Now, click 'Save' on the top left and give the report a name. Make sure you save the report in a folder that your Salesforce user account has access to or under public folders. Geckoboard cannot read private reports within your Salesforce account. Also, while saving the report, make sure to run the report as well, using the 'Save and Run Report' option. 1) Head over to your Geckoboard account, click on '+Add widget' and search for the Salesforce integration (if you aren't there already). Choose the one that says 'New'. 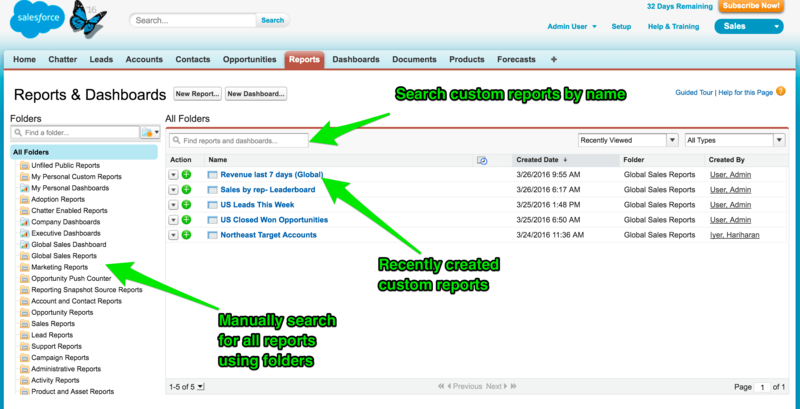 2) From the 'Choose Report' section, search for and select the report you just created in Salesforce. 3) The widget configuration page will show up. Select the Number visualization from the top right. You'll be able to see a preview of the widget. 4) Enable the option to set a Goal and fill in your Goal value. 5) Enter the widget title using the option at the top. 6) You can specify the widget size using the drop down towards the right. For our Sales dashboard example, we'll leave it at the default 1x1. 7) You can also specify how often this widget should refresh. 8) When you're happy with all the widget settings, click 'Add to dashboard'. You now have your first Salesforce widget on your dashboard! We'll be using the same steps for the remaining widgets — creating a custom report in Salesforce and then building the widget on the dashboard based on that report. This Leaderboard widget stacks up the individual performance of the US Sales reps. It displays the number of opportunities won by each Sales rep in the current year to date. 1) We'll again be building a custom report but in this case, we'll customize an existing standard report in Salesforce — the 'Sales by Rep' report. Head over to your Salesforce account and click on the 'Reports' tab. 2) Click on the 'Sales Reports' folder from the list on the left hand side and then choose the 'Sales by Rep' report. 3) The report should display. Go ahead and click on the 'Customize' button near the top of the report. 4) We'll be using a Matrix report to power this widget, so go ahead and change the format from Summary to Matrix. Select 'All opportunities' from the Show drop-down. The above fields use the default settings of the 'Sales by Rep' report. Next, click on the 'Add' next to Filters (use the 'Field Filter' option if you've clicked on the triangle next to 'Add'). Set 'Account: Address - Billing Country' equals US. Click 'OK' when you're done. 5) A preview of the report should now show up. It may have columns that aren't particularly useful for this report. So go ahead and remove the ones you don't need. You can then also rearrange or add more columns to help make more sense of the report. 6) As this report is based on the 'Sales by Rep' standard report, by default, the report summarizes based on 'Record Count' and 'Sum of Amount'. These should be enough as it'll let us display the total number of Closed Won opportunities by individual Sales reps in this year to date. Also, if you'd like, you can display the total amount won by each Sales rep instead. 1) Head over to your Geckoboard account, click on '+Add widget' and search for the Salesforce integration. Choose the one that says 'New'. 3) The widget configuration page will show up. Select the Leaderboard visualization from the top right. You'll be able to see a preview of the widget. 4) Enter the widget title using the option at the top. 5) You can specify the widget size using the drop down towards the right. For this Leaderboard widget, let's set it to 2x2. 6) Set the 'Values' to 'Sum of Amount' in place of 'Record Count' if you'd like to display the total amount won by each Sales rep instead of their total number of closed won opportunities. 7) You can specify how often this widget should refresh. You should now have a working Leaderboard on your dashboard! Let's continue with the same process and build another custom report in Salesforce to power the 'Revenue last 7 days (Global)' widget. This widget displays the figure of the 7-day revenue across the whole company worldwide. Seeing this fluctuate from week-to-week gives the team context as to how the company as a whole is performing over that period. 1) We'll be customizing an existing standard report again in Salesforce — the 'Closed Opportunities' report. Head over to your Salesforce account and click on the 'Reports' tab. 2) Click on the 'Opportunity Reports' folder from the list on the left hand side and then choose the 'Closed Opportunities' report. 4) We'll be using a Summary report to power this widget, so go ahead and change the format from Tabular to Summary. 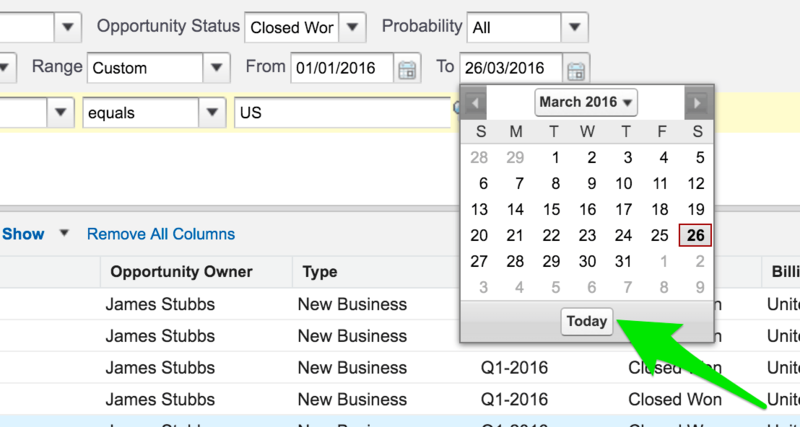 The above fields use the default settings of the 'Closed Opportunities' report. Set Range: Last 7 days (the From and To fields will automatically populate). 6) A preview of the report should now show up. It may have columns that aren't particularly useful for this report. Keep the 'Opportunity Name', 'Account Name' and 'Amount' columns as we'll need these to create groupings in the report and to display the total revenue figure in the widget. Go ahead and remove any other columns you don't need. You can rearrange or add more columns to help make more sense of the report, if you'd like. 7) Now, group the 'Opportunity Name' field by either dragging and dropping the column or by using the drop down available when you hover over the 'Opportunity Name' column header. You can also group by 'Account Name' instead if you'd prefer that. 8) Now, click 'Save' on the top left and give the report a name. Make sure you save the report in a folder that your Salesforce user account has access to or under public folders. Geckoboard cannot read private reports within your Salesforce account. Also, while saving the report, make sure to run the report as well, using the 'Save and Run Report' option. 4) Select the 'Metric' as 'Sum of Amount'. 5) Enable the option to set a Goal and fill in your Goal value. 6) Enter the widget title using the option at the top. 7) Since we want to give prominence to this figure, let's set the widget size to 2x2 using the drop down on the top right. 8) You can also specify how often this widget should refresh. 9) When you're happy with all the widget settings, click 'Add to dashboard'. Your dashboard will now be displaying your company's total revenue for the past 7 days! This widget displays a figure showing the contribution of the US Sales Team to the company's weekly revenue. 1) We'll only need a few tweaks on the custom report we previously created for the 'Revenue last 7 days (Global)' widget. We'll then save it as a new custom report and use it to power this 'Revenue last 7 days (US)' widget. 2) Head over to your Salesforce account and click on the 'Reports' tab. Salesforce automatically lists the custom reports you've recently created or accessed, so you should be able to see the report you've previously created for the 'Revenue last 7 days (Global)' widget. If not, you can simply search for the report by name using the search bar or manually search from the folders on the left. 3) Once you find the required report, click on it to proceed ahead. 4) When the report displays, click on the 'Customize' button. 5) We only need to add a filter to the existing report to start tracking the revenue being generated by the US Sales Team. Click on the 'Add' next to Filters (use the 'Field Filter' option if you've clicked on the triangle next to 'Add'). 6) We'll need to save this as a new custom report, so go ahead and click 'Save As' on the top left and give the report a name. Make sure you save the report in a folder that your Salesforce user account has access to or under public folders. Geckoboard cannot read private reports within your Salesforce account. Also, while saving the report, make sure to run the report as well, using the 'Save and Run Report' option. 7) Set the widget size to 1x1 using the drop down on the top right. Your dashboard will now display your US Sales Team's performance for the past 7 days! This widget displays a figure showing the contribution of the UK Sales Team (closest rival in terms of performance to the US Sales Team) to the company's weekly revenue. 1) We'll only need to modify the filter on the custom report we just created for the previous 'Revenue last 7 days (US)' widget. We'll then save it as a new custom report and use it to power this 'Revenue last 7 days (UK)' widget. 5) Hover over the 'Billing Country equals US' filter and edit it. Set the filter as 'Billing Country equals UK'. Click 'OK' when you're done. The steps for building this widget on your dashboard are exactly the same as for the 'Revenue last 7 days (US)' widget. Click here if you'd like to view those steps again. Your dashboard will now display your UK Sales Team's performance for the past 7 days! 1) Click on '+Add widget' and search for the Clock widget. Select it to proceed ahead. 2) Choose your location, timezone and the display format (24 or 12 hour). 3) On our example dashboard, we've kept the widget title blank. You can use a title if you'd like to. 4) The Clock widget supports only the 1x1 size. 5) Once you're happy with the settings, click 'Add widget'. This feature is especially handy when you want to, say, move the full-width Text widget to the top of the dashboard and adjust the remaining widgets correspondingly.